Now, if a bird or a fish tries to reach the end of its element before moving in it, this bird or this fish will not find its way or its place. When you find your place where you are, practice occurs, actualizing the fundamental point. When you find your way at this moment, practice occurs, actualizing the fundamental point; for the place, the way, is neither large nor small, neither yours nor others’. The place, the way, has not carried over from the past, and it is not merely arising now. Accordingly, in the practice-enlightenment of the buddha way, to attain one thing is to penetrate one thing; to meet one practice is to sustain one practice. The present encounter will change your mind now or never. Noticing that is has changed would be another change. If you want to know the meaning of buddha-nature, you should observe times and seasons, causes and conditions. Though there are many features in the dusty world and the world beyond conditions, you see and understand only what your eye of practice can reach. According to the glossary of this translation (Tanahashi 2010), ‘beyond conditions’ is ‘格 外 [kakugai], literally, outside frameworks.’ A psychologist might say “beyond conditioning”; in Turning Signs we may say beyond the cognitive bubble. Or we might say that Dogen’s point is the flip side of Peircean pragmatism. Looking back through my old notebooks, I find that many of the thoughts sketched in them are forgotten for years, and then revived and reworked as new. I suspect that such forgettings occur for everyone, and they may be especially common in those who write or paint or compose, for creativity may require such forgettings, in order that one’s memories and ideas can be born again and seen in new contexts and perspectives. 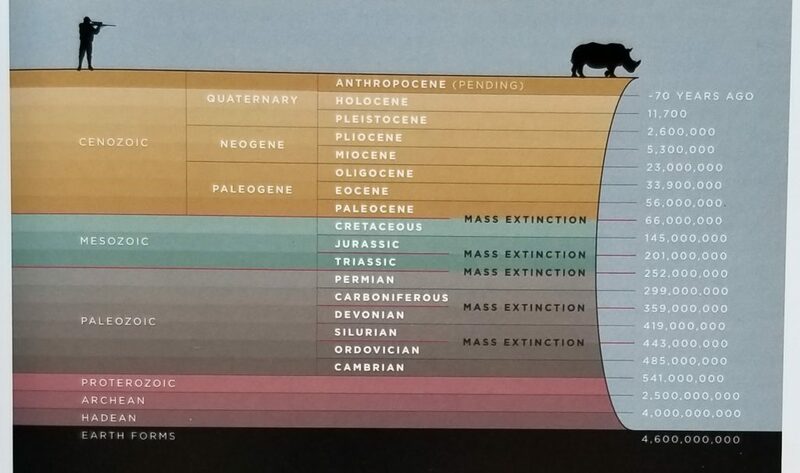 Last week, blogger and cultural critic Adrian Ivakhiv responded to my post on ‘Holocenoscopy’ with a post on his own Immanence blog which takes my own thoughts on the “Anthropocene” a few steps further. Since then most of my prime reading time has gone into his new book Shadowing the Anthropocene, which i bought and downloaded (PDF) from punctum books. It offers some fascinating insights, both theoretical and practical, on how we can live through these trying times. Also, being a lover of cinema, I’m delving into his earlier book Ecologies of the Moving Image. Besides thought-provoking movies and the “AnthropoScene,”Adrian and I have several interests in common, including Peircean and process-oriented philosophy and an ecological perspective on things. His work strikes me as complementary to mine in that he is much more broadly acquainted with recent theorizing in the “social sciences” and “humanities” than I am, while my sources in Turning Signs incline more toward the “natural sciences” of biology, psychology, neuroscience etc. I don’t know how he will feel about my characterization of him above as a “cultural critic,” but it seems clear that we are both boundary-crossers in terms of the traditional disciplines, although (unlike me) he’s employed as an academic (University of Vermont). Anyway i find his work very refreshing and i’ll be exploring it for some time to come. I would recommend that readers of Turning Signs take a close look at his blog, at least. And they leap so looply, looply, as they link to light. In conscious visual processing, for example, high-level information is dynamically mapped back to low-level information, but it all refers to the same retinal image. Each time your eyes land on a scene (remember, your eye makes about three saccades per second), there is a feedforward-feedback cycle about the current image, and that cycle gives you the detailed conscious percept of that scene. You continuously make conscious snapshots of the world via these feedforward-feedback cycles. In a more general sense, the principle is that the almost continuous feedback-loops from higher to lower areas create an ongoing cycle, a circular nested flow of information, in which what happened a few milliseconds ago is dynamically mapped back to what is coming in right now. In this way, the immediate past continuously creates a context for the present— it filters what can be experienced right now. We see how an old philosophical idea is refined and spelled out by modern neuroscience on the nuts-and-bolts level. A standing context-loop is created. And this may be a deeper insight into the essence of the world-creating function of conscious experience: Conscious information seems to be integrated and unified precisely because the underlying physical process is mapped back onto itself and becomes its own context. If we apply this idea not to single representations, such as the visual experience of an apple in your hand, but to the brain’s unified portrait of the world as a whole, then the dynamic flow of conscious experience appears as the result of a continuous large-scale application of the brain’s prior knowledge to the current situation. If you are conscious, the overall process of perceiving, learning, and living creates a context for itself— and that is how your reality turns into a lived reality. … and animals, both wild and tame, feeding in the air or on the earth or in the water, all are born and come to their prime and decay in obedience to the ordinances of God; for, in the words of Heraclitus, ‘every creeping thing grazes at the blow of God’s goad’. In the original Greek of Heraclitus, as quoted here by the author of On the Cosmos, there is no “God” and no “goad”. A more literal translation of πᾶν ἑρπετὸν πληγῇ νέμεται would be “All beasts [πᾶν ἑρπετὸν] are driven [νέμεται] by blows [πληγῇ].” But the verb νέμεται was ordinarily used with reference to herdsmen “tending” their flocks or herds; driving the beasts to a pasture where they could ‘graze’ was a regular part of this “tending,” and this was often done with a stick like the one in the picture. This explains the grazing and the ‘goad’ in Forster’s translation. But the Greek does not specify who is delivering these benevolent ‘blows’ to the beasts. 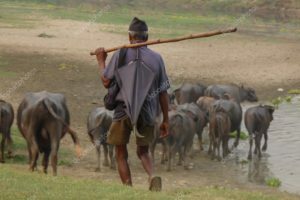 The context indicates that the class of “creeping things” includes not only domestic cattle but all animals throughout their life cycles, including wild and human animals as well (Kahn 1979, 194). Who or what drives the deer to their pasture? What kind of “blows” compel us to carry our own lives forward? “Pseudo-Aristotle” tells us that all life cycles proceed according to ‘the ordinances of God,’ who is metaphorically the “pastor” driving us all to “pasture.” Others might substitute for those ordinances the laws of nature, governing everything impersonally. But if all animals are guided from within and powered by their own metabolism, it would seem that we are driven by internal “blows” or “motivations” rather than external forces, whether divine or natural. We are “driven” to dinner by the same “force” that drives the deer to their pasture, namely hunger. But this is not the whole story either. We are all shaped, physically and mentally, by the same sacred laws of nature that formed the worlds we inhabit and the habits that inform our relations with the world and one another. These Laws have made us all anticipatory systems, and the “blows” driving us are the blows of experience, which happens to us as some kind of collision between our guidance systems and our circumstances. An experience feels real here and now because of the difference, the Secondness, between our own needs and the necessities of external world. But what really determines the kind of experience that strikes us at the moment is the Laws in their Thirdness. For reality is compulsive. But the compulsiveness is absolutely hic et nunc. It is for an instant and it is gone. Let it be no more and it is absolutely nothing. The reality only exists as an element of the regularity. And the regularity is the symbol. Reality, therefore, can only be regarded as the limit of the endless series of symbols. Our lack of control over existing things and actual events, their way of forcing themselves on our attention, is what makes them real to us at the moment. But the laws governing these things are equally real – or more real, considering that they will continue to determine what form the future will take long after the immediate past and present are gone. To the extent that we have self-control – that is, control over the form and the enforcement of our inner “laws” or habits – we can participate in this determination of the future. We never break the laws of nature, but we have ways of co-operating with it to realize imagined possibilities; and these may include our ways of responding to the “blows” of experience. 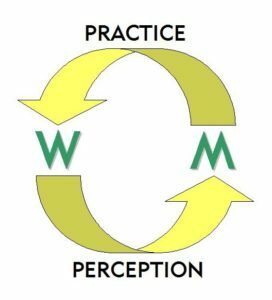 Life cycles, like meaning cycles, are governed by the reciprocity of practice and perception. They are driven by the “blows” of experience just as inquiries are set in motion by surprises. This is a law of nature which we can only symbolize in some kind of diagram. We can’t make a photograph of it as we can an existing ‘goad’ or an actual ‘blow.’ The image of ‘God’s goad’ confuses the regularity of law with the the force of law. A law (natural, human or divine) has a general form but can’t be adequately represented by any specific image – unless that image is read as a metaphor. Metaphors, in their aspiration to the generality of symbols, reveal those realities which images conceal by their very presence to our sense perception. Only symbols can express the Law turning the wheel of life.